Too bad there wasn’t a rain coming by at th same time. 4 modes of transportation:boat, car, train& footpower. When I was a kid, just for the fun of it, I spent several nights in an abandoned barge anchored in the river at the levee’s edge. Having lived in New Orleans for many years, I saw this sight more times than I can count. It never gets old to me, and thanks for the memories. 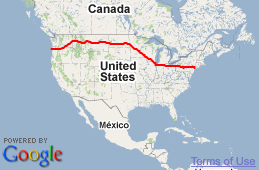 These tracks are the route of Amtrak’s Empire Builder — which runs between Chicago and Portland and Seattle! I rode this train last month — my timing was a bit off I guess, if I had gone now, I might have seen you just walkin! :) The eastbound train would run past where you are each day at midmorning. Anyway, looks like you are having a beautiful sunny day in Minnesota. Wish I could walk with you for a ways! BRAVO to all the kind people who have helped Matt along the way!!! !